Lanes will be shifting to right on bridge over Route 110 and George Washington Memorial Parkway ramps Thursday night, April 11. At the Freedom Museum on April 23, at 7:30 p.m., travel into a new world via an overview of electric aircraft and its commercial application; a discussion of aviation project management and particularly how it relates to military aviation. Governor Ralph Northam has officially launched ConserveVirginia, a statewide, land conservation strategy that identifies high value lands and conservation sites in six categories. Caregiving during the three key stages of Alzheimer’s disease will be the focus of a seminar May 4 at Edward Kelly Leadership Center, the Prince William School Division's central office. On April 6, detectives from the Robbery Unit concluded an investigation into two armed robberies that occurred on April 1 at the McDonald’s on Dale Blvd. 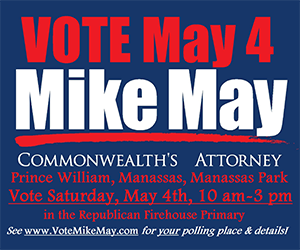 and April 5 at the Chic-Fil-A on the Prince William Pkwy. in Woodbridge (22192). On April 4 at 1:42PM, a School Resource Officer (SRO) received information of a potential threat of violence at Graham Park Middle School.